This hike once again tackles Mt. Bonomine 棒ノ峰山 though this time from a southerly approach. 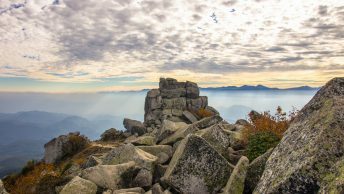 The advantage of taking this particular route is twofold: firstly the hike can be undertaken without the need for an extended bus trip unlike the hike from Lake Naguri. Secondly the hike is noticeably easier than using the rather arduous Sengaku Ridge 仙岳尾根 as describe here in a previous blog post. Reaching the trail head can be met by catching a bus from Kawai Station 川井駅 one stop from Mitake station on the JR Ome Line. On weekend mornings three buses head to all the way to Seitobashi 清東橋 (16 mins, 260 yen) which is nearest to the start of the hike click here. The other option involves walking the 4.7 km along route 202 which takes around 90 minutes. Having miss timed my departure I succumbed to the later option which provided the chance to shadow the scenic Otabagawa River 大丹波川 and watch local fisherman indulging in their favourite pastime. The trail head commences by walking 10 minutes from the Seitobashi bus stop adjacent to the Okujaya Campsite 奥茶屋キャンプ場. From here a small foot bridge crosses the river with signs pointing towards Mt. Bonomine 棒ノ峰山 and Mt. Kuroyama 黒山. 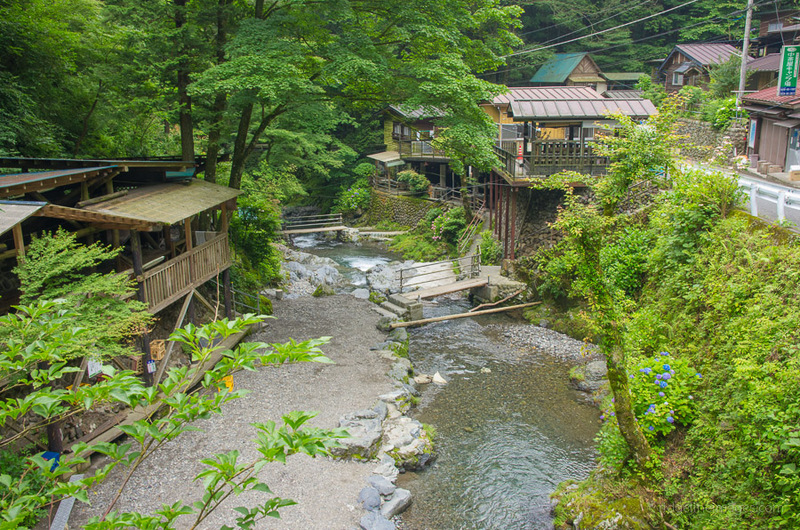 The first thing to notice are the secluded Japanese radish or wasabi 山葵 fields nested in the pristine waters of the valley steps. From the outset the hike is rather steep though soon reverts to endless switch backs which at least lessen the burden on your legs, and in a little over an hour you should be nearing the summit. Being early summer the view from Mt. Bonomine (969 m) was regrettably shrouded in mist with only the briefest glimpse of Lake Naguri coming into view. After a short lunch break the next point of call was Mt. Kuroyama. In contrast the walk across to Mt. 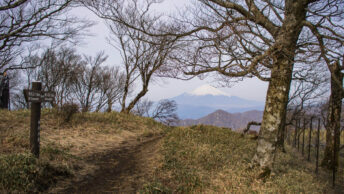 Kuroyama (842 m) much less taxing taking 30 minutes from Mt. Bonomine. Though Mt. Kuroyama is hemmed in by trees it makes for a pleasant rest stop with some benches to rest weary feet. Onwards from Mt. Kuroyama you happen across Nasaka Pass 名坂峠 a trail junction for heading to Mitake Station or shortcutting back to route 202. Just after commencing Nasaka Pass I suffered an almost ignominious end as I lost my footing on the near eroded path. Luckily my slip was impeded by a nearby tree stump as the consequences could have been more severe. On secondary inspection a hand written notation below the sign alludes to the impending hazard. This trail eventually meets up again with route 202 after about 30 minutes where you can retrace your steps back to Kawai Station. 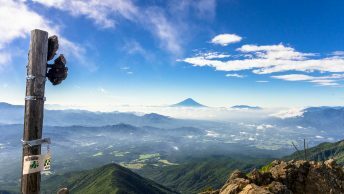 Other than recommending taking the bus to the trail head, this less ventured hike provides a chance to climb a prominent ridge line dividing Tokyo and Saitama prefectures. Thanks for the write up! This is the fifth day hike I’ve done from Ridgeline, which has been insanely helpful. I thought I would add a quick account of my day for anyone else who is looking to do this one. The bus that runs from Kawai Station up to the trail head is very hard to get. It either runs very early in the morning (impossible to make with train timetable), or a little to late which would make for a late start to the day. I ended up walking to the trail head rather than waiting an hour for the next bus (which also only goes halfway at that time). The 4.5km to the trailhead took me about 70 minutes and I was the only one doing it. In fact, for the first “half” of the trek (up to Mt. Bonomine) I didn’t see another hiker. However at the summit there was a lot of locals. I later found out from chatting with one that most of them do it the opposite way, starting from Mitake station, they hike the four mountains, (the last being Bonominesan) and then descend to route 202 where they catch a bus back to Kawai. I think the advantage of doing it in reverse is that there seem to be better timed buses running towards Kawai Station in the afternoon. After reaching Nasaka Pass 名坂峠 I ended up going all the way back to Mitake station rather than descending back down to route 202. This made the hike pretty decent, as you tackle four mountains in total (Bonominesan 棒ノ嶺山, Kuroyama 黒山, Iwatakesan 岩茸石山, Sogakusan 惣岳山). Being a bit worried about making the whole way, I kinda rushed it, so I ended up doing the whole walk from Kawai station up and over the four peaks and back to Mitake station in 6 hours. I don’t have a trail map so I’m not sure exactly how long it was, but my iPhone (dubious source) thinks that it was 21kms. Going from station-to-station definitely makes this hike a “moderate” difficulty in my opinion. The views from the four peaks are spectacular, and would be much better in the colder months when there is less haze. Thanks for checking out the site and for posting your hiking account. Next time I would recommend tackling the Nagasawa ridgeline in the opposite direction up to Mt. Tenmoku as I did recently over Golden Week. The crowds thin out even more and there are plenty of places enjoy some fine scenery.